ERC Photo Slide Show Here What is the ERC and the GY Program? 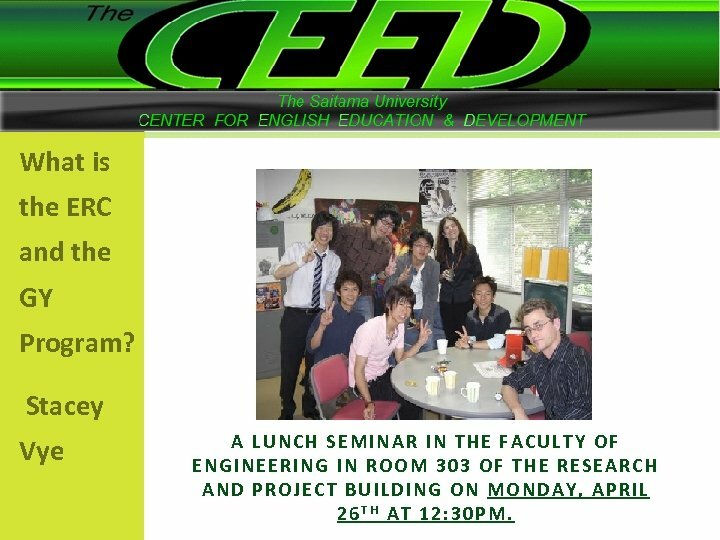 Stacey Vye A LUNCH S EMINAR IN THE FACU LTY OF ENGINEERI NG IN RO OM 303 OF THE RESEARCH A ND PRO JEC T B UILDING ON MON DAY , APRIL 26 T H AT 12: 30 PM. 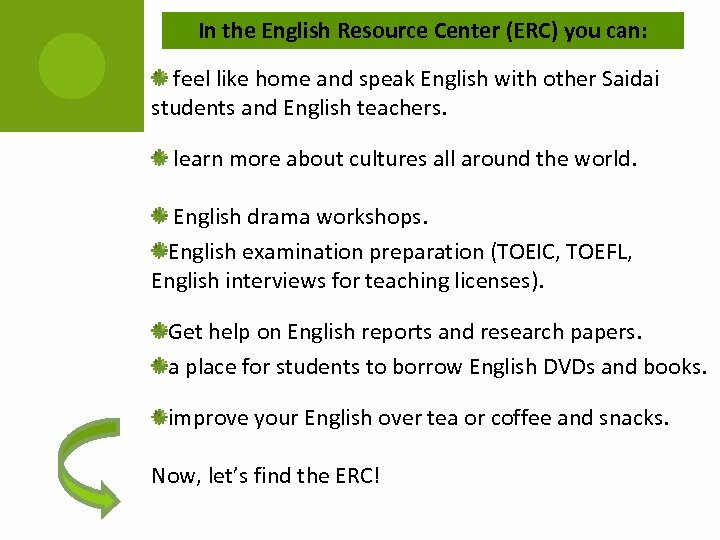 In the English Resource Center (ERC) you can: feel like home and speak English with other Saidai students and English teachers. learn more about cultures all around the world. English drama workshops. English examination preparation (TOEIC, TOEFL, English interviews for teaching licenses). Get help on English reports and research papers. a place for students to borrow English DVDs and books. improve your English over tea or coffee and snacks. Now, let’s find the ERC! 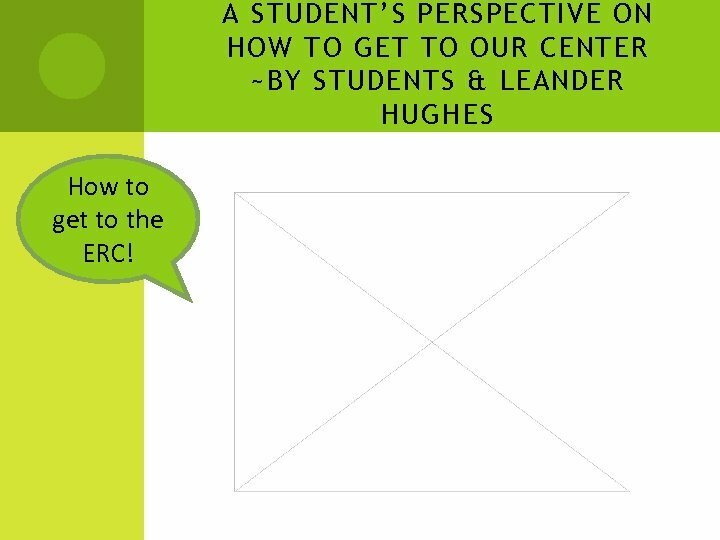 A STUDENT’S PERSPECTIVE ON HOW TO GET TO OUR CENTER ~BY STUDENTS & LEANDER HUGHES How to get to the ERC! 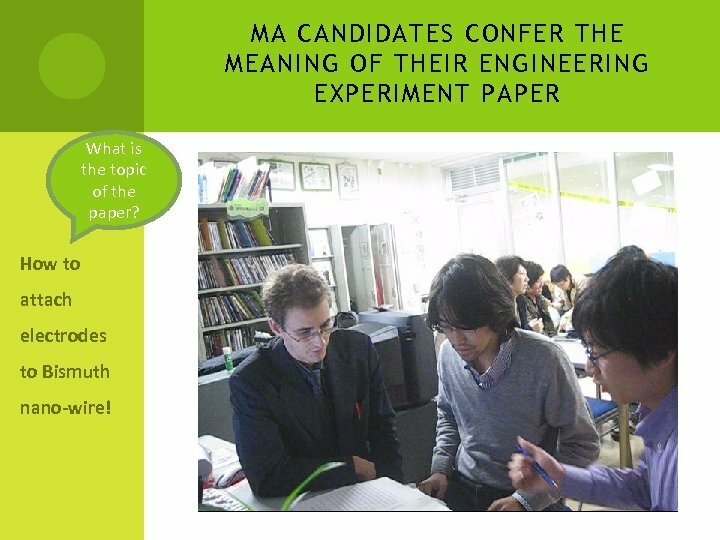 MA CANDIDATES CONFER THE MEANING OF THEIR ENGINEERING EXPERIMENT PAPER What is the topic of the paper? How to attach electrodes to Bismuth nano-wire! W HAT IS THE G LOBAL Y OUTH ( GY) P ROGRAM? 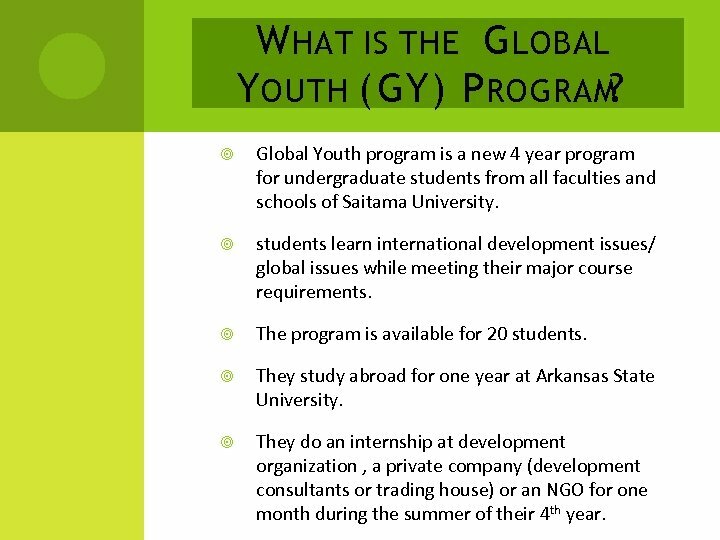 Global Youth program is a new 4 year program for undergraduate students from all faculties and schools of Saitama University. students learn international development issues/ global issues while meeting their major course requirements. The program is available for 20 students. They study abroad for one year at Arkansas State University. They do an internship at development organization , a private company (development consultants or trading house) or an NGO for one month during the summer of their 4 th year. T HE GY P ROGRAM (CONT. ) Each student must have a TOEIC score of 600 or more and take a selective test that consists of a short-essay and an interview. GPA (The Grade point average ) of the spring semester and score of TOEIC will be considered in the selection. 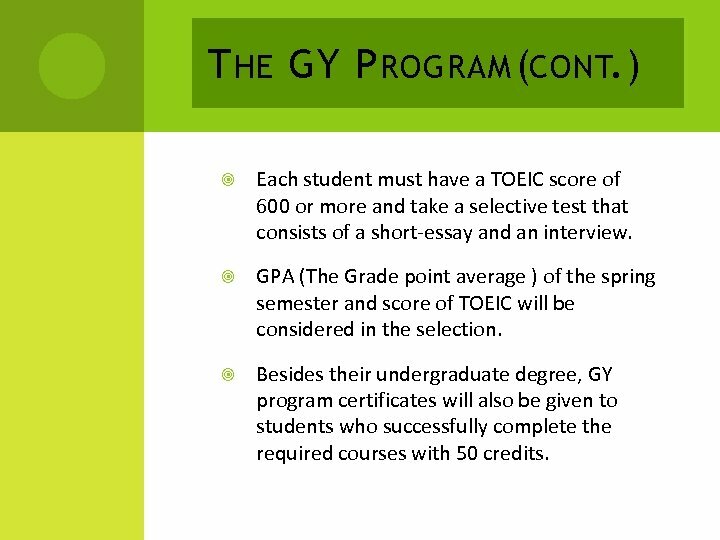 Besides their undergraduate degree, GY program certificates will also be given to students who successfully complete the required courses with 50 credits. 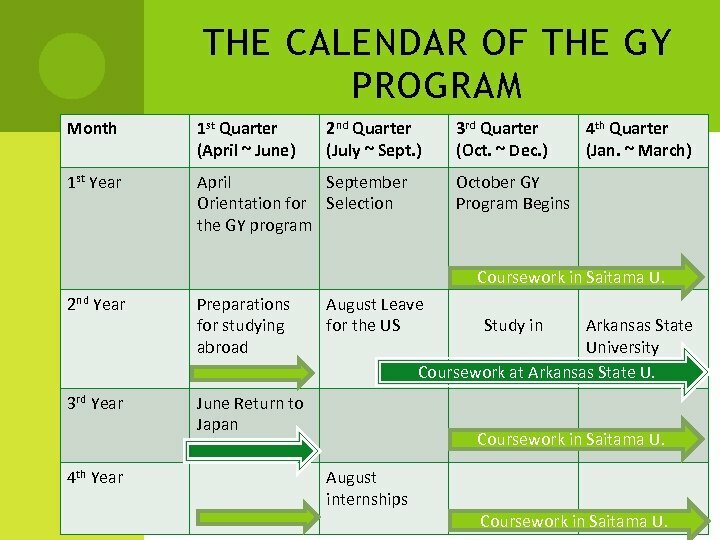 THE CALENDAR OF THE GY PROGRAM Month 1 st Quarter (April ~ June) 2 nd Quarter (July ~ Sept. ) 1 st Year April September Orientation for Selection the GY program 3 rd Quarter (Oct. ~ Dec. ) 4 th Quarter (Jan. ~ March) October GY Program Begins Coursework in Saitama U. 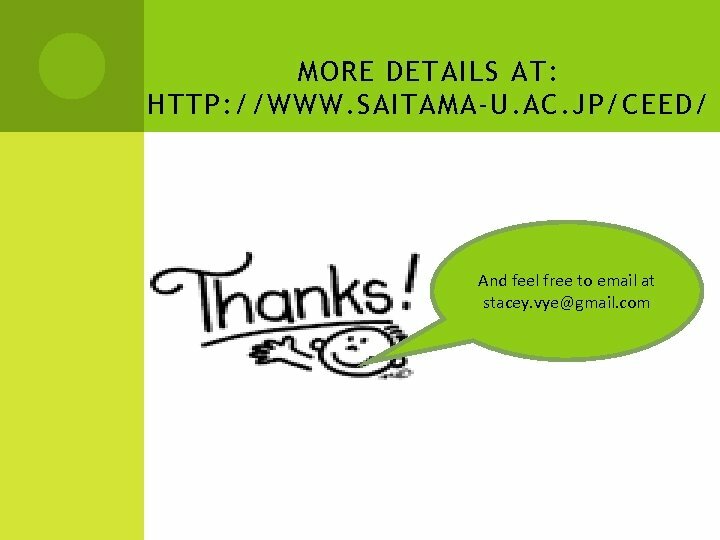 2 nd Year Preparations for studying abroad 3 rd Year June Return to Japan 4 th Year August Leave for the US Study in Arkansas State University Coursework at Arkansas State U. Coursework in Saitama U. August internships Coursework in Saitama U.